I purchased this knife because my Kershaw Leek was illegal in the UK. I was searching for a solid, inexpensive, edc knife that would not be an issue anywhere. It is wonderfully thin and won't raise any eyebrows like say, a clip on your pocket at the office. The Douk Douk is fantastic. It is nothing fancy at all. Just a perfect tool. It is just a few pieces of stamped steel, no lock, nothing flashy. It simply does the job every time. The blade holds an edge decent enough, I literally sharpen it on the underside of a coffee mug though. Very interesting history behind the knife. My only real issue is that the intricate blade designs will wear off rather soon. 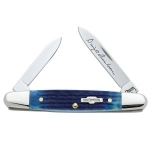 Great knife for collectors and a great blade to just always have on you.